Ratu Bagus : Energy Orbs Angels Devas ! Ratu is a self realised master, whose teaching has been received direct from the light. 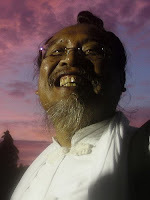 Ratu Bagus (meaning good king) is an extraordinary spiritual teacher. Ratu has the ability to develop our lives beyond what we could ever have imagined. He shows us how to truly heal ourselves by opening our hearts and helping us to connect to divine love. Those that meet him are touched by his sweetness, his love for humanity and endless compassion. Ratu is endlessly creative in his approach to awaken our desire for freedom, he is both humble and powerful, with a wonderful sense of humour, he is completely accepting of everyone, he sees the light that is who we truly are, Ratu at Bramin Ceremonyand invites us to realise this too. Ratu has touched the lives of many, to meet him is a truly life changing experience. The phenomenon of Energy Orbs has become more and more visable at the ashram.These beautiful representations of planetary energy are becoming manifest in response to the ever-growing level of consciousness present at this time. The pictures shown here taken at the ashram and around Ratu were taken by many people, on many cameras at different times. They capture the essence of these energies at play. Feeling their presence and working with them during training and meditating allows one to connect with our highest potential, free from the limits of the mind. When one is connected through feeling to these energy orbs spinning throughout the body occurs, while held in the safety of ones own orbit, it can feel like dancing through the universe. This is an excerpt from a recorded talk by Ratu at the ashram in April '09. The footage clearly shows energy orbs moving quickly within the room, and is very unusual as orbs are rarely caught on video camera. On the sacred day of Nyepi or Day of Silence, it is traditional in Bali that no light or mains electricity is used, and people don't leave their homes. The whole island is silent and in darkness. This film is made from the exceptional images taken at the large Nyepi Ceremony that was held at the ashram in 2009.